All Butler Transit Authority northbound commuter bus routes will pick up at the East Busway (Section D). Below are pictures and directions provided by the Port Authority of Allegheny County to help assist commuters to the East Busway stop. 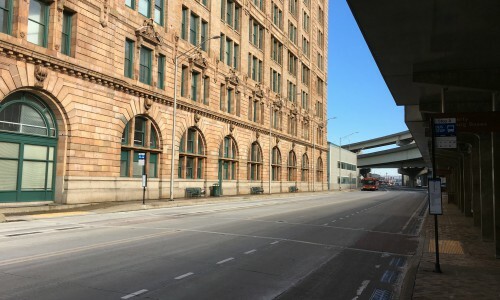 From the intersection of Liberty Avenue and Grant Street (eastern side), passengers can cross the front of the East Busway from Grant Street, or cross Liberty Avenue (and Eleventh Street) from in front of the Liberty Center sidewalk and plaza – and access the sidewalk in this picture. This was the traditional walkway that millions of train commuters used to use for over 100 years to go to their trains. Walk up the complete length of the sidewalk to the first arch of the rotunda of the Pennsylvanian Apartments (first arch in the left of the picture); make a right and continue in front of the building under the Rotunda (if you go straight, you’ll go back to the Amtrak Station). After making the right (staying on the sidewalk) go completely in front of the main entrances of the former train station, now apartments under and through the Rotunda to its other side (see the three white diamond construction signs) At those signs, make a left and walk back on that sidewalk the entire length of the building (and past the approaching bus in the picture). Use either of the busway sidewalks (or the light rail platform) their entire distance. If against the former railroad station, Stop D will be immediately beyond and behind it; if using the outbound sidewalk or light rail platform, the crosswalk to be used is being traversed over by the bus in the picture. Before completing the first option – If you’re on Grant Street and don’t want to cross – or on Grant at the Moorehead Federal Building, you can cross Grant there as well – There is a sidewalk on the immediate back of the Federal Courthouse which will take passengers around their underground driveway entrance, then on to Port Authority's “Jughandle” island (this is where the inbound buses will pull in and discharge passengers), which then crosses over to Port Authority's East Busway outbound Stops “A” & “B” and the platform for Port Authority's light rail system at its Penn Station stop – one can use this side as well and walk completely back across its length, to the second crosswalk, where the busway must be crossed to get to Stop D.
This picture shows the stop being used by New Castle Transit to load their outbound trip along with some staged Westmoreland Transit buses.